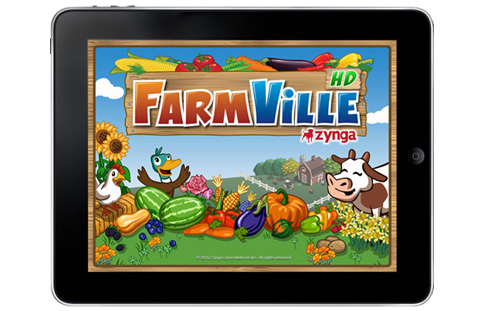 FarmVille developers Zynga have just released the iPad version of the game as a free and universal app and it’s available to download in the App Store right now. This is the first native app from Zynga for the Apple platform and though the app is especially designed for the iPad with graphics that take advantage of the tablet’s display, it can also run on an iPhone and iPod Touch. We want to reach people wherever they want to play the games they love, and deliver the most fun and social experience on every platform. The iPad is a spectacular gaming device, and the new FarmVille app leverages its larger touch screen interface and enhanced graphics. FarmVille on the iPhone was an instant hit and now we are giving people another Apple device to play on. The app supports Apple’s Game Centre which is reported to be arriving for all iPad users in the next few weeks. It’ll require one of the iOS 4.2 betas to work. Users will get push notifications for performing tasks in the game like harvesting etc and also updates about the status of your crops to warn you if they’re in danger of withering. The iPad’s touchscreen allows players to zoom in and out and view different plots of lands easily. Players will have access to the same farm that they have on Facebook and same friends that they play with so there’s no need to worry about starting all over again. FarmVille for the iPhone was released in June this year and it became one of the top 25 games on iTunes very soon, staying on the list for more than 50 days. According to reports, players from 85 different countries send more than 100,000 gifts every day via the iPhone app. FarmVille has more than 60 million players worldwide with numbers growing on a daily basis and now the iPad version of the game can safely be expected to add a huge number of players to this virtual farming phenomenon.